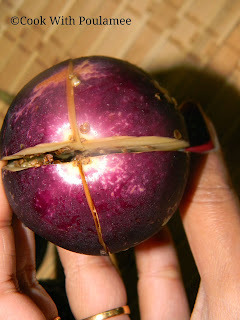 After a long time I purchased some baby eggplants or Brinajl from shop, while buying only I am really excited because eggplant is one of my favorite vegetables. I really didn’t want to cook them in simple way so I tried to cook it in Andhra style. And they turned out too good. 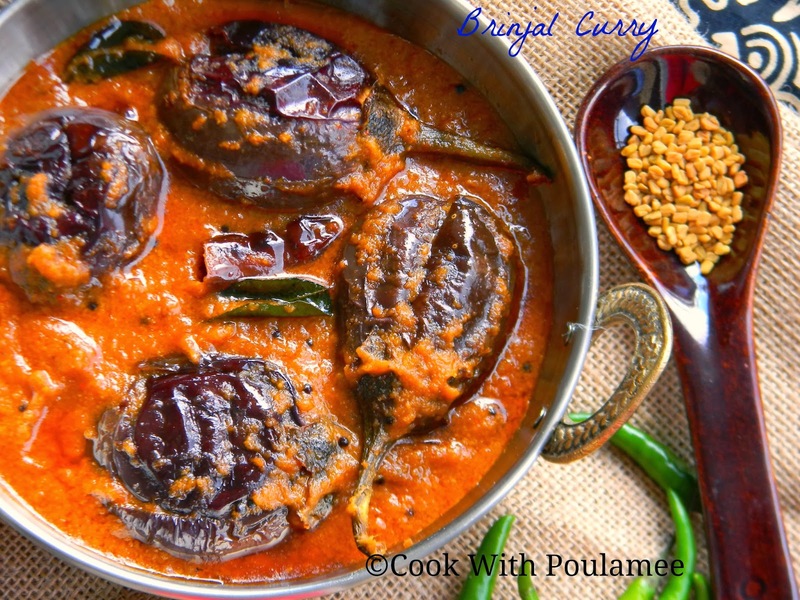 The taste of tamarind made this dish so different. I think this one is perfect for Roti or you can have with rice also. 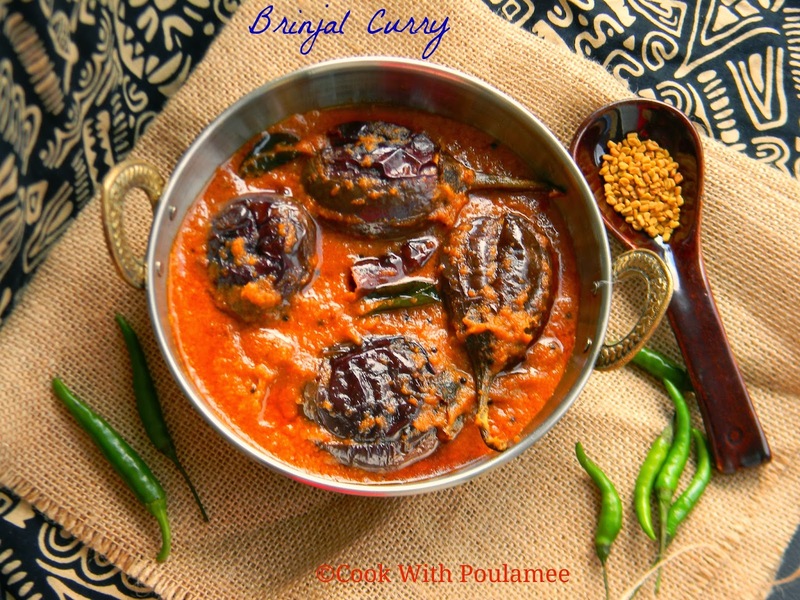 The baby eggplants are really soft so you don’t need to cook for a long time, but the freshness of the brinjals gave this dish a different look also. I added some fresh coconut also to make the gravy thick. 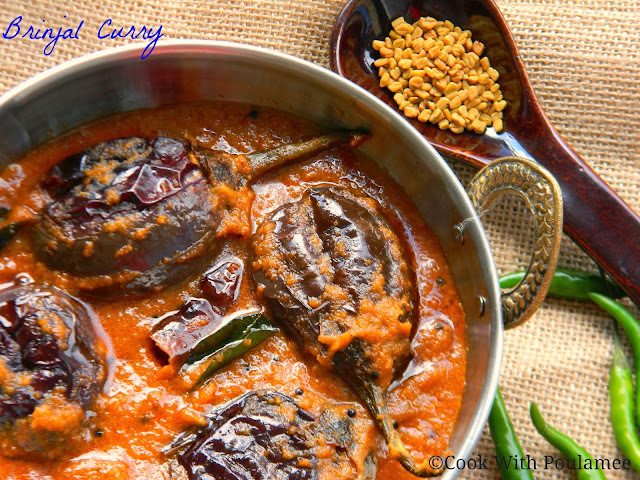 A very easy way to feast yourself with this simple EGGPLANT CURRY, and perfect for vegetarian guests too. 1.Few baby eggplants (4 to 6). 5.One tea spoon ginger paste. 6.One tea spoon garlic paste. 8.Half tea spoon red chili powder. 9.Half tea spoon coriander powder. 10.Few mustard seeds, Few meethi/fenugreek seeds, one dry red chili, Few curry leaves. 13.one table spoon tamarind pulp water. 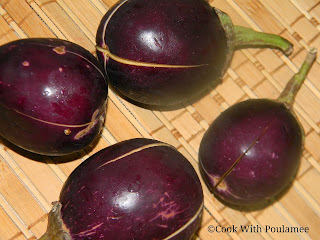 Wash the baby eggplants, now cut them on top horizontally and vertically like + but don’t cut it completely. Now add some oil in a vessel and fry the brinjal pieces with a cover, just fry till the brinjals look soft and keep them aside. Now in a different vessel and some oil, allow it to hot then add the sliced onions and fry them till the onions are soft. Now add the ginger garlic paste and sauté for some time. Now add the chopped tomato, red chili powder and coriander powder salt and shredded coconut and cook for 4 to 5 mint in low flame with a cover. 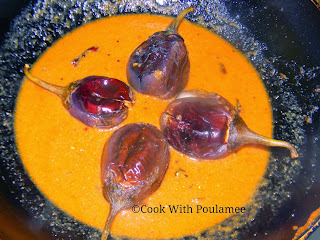 Now allow it to cool and make a fine paste with the masala mix. Now add some oil In a separate bowl, then add the mustard seeds, meethi seeds, curry leaves and dry red chili then slowly add the masala mix and cook for few mints. Now add some sugar and the tamarind pulp water and some extra water also and mix well, now cook this with a cover till the oil start floating on top. Now add the fried baby eggplants and cook for another 3 to 4 mints with cover. 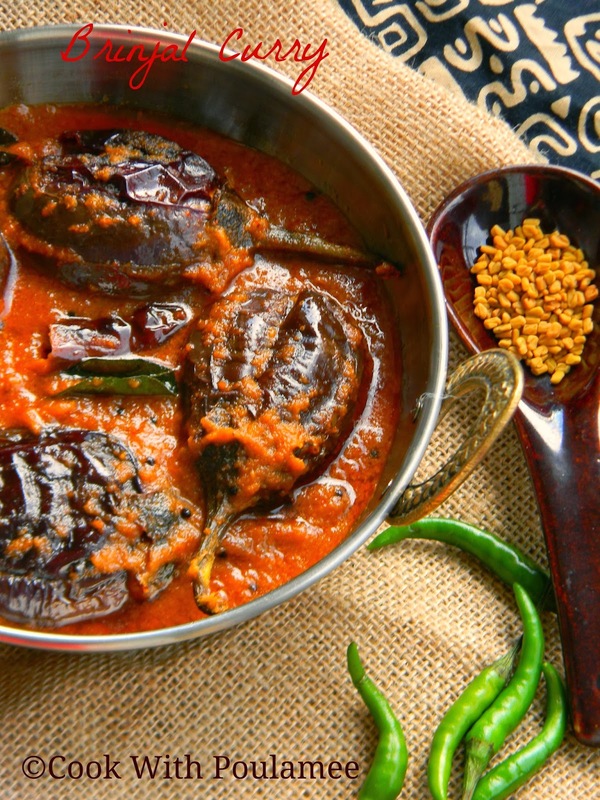 Now switch off the flame you easy BABY EGGPLANT CURRY or MASALA BRINJAL is ready to serve.